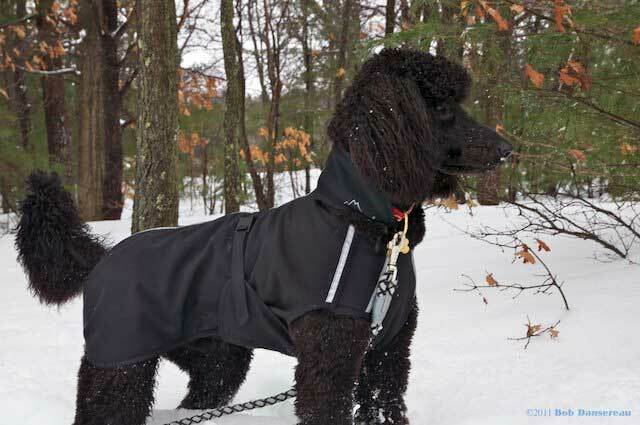 Alpenhitze™ custom dog coats put an end to dog gear that doesn't fit, or falls apart after one season! Alpenhitze™ coats are sewn to your dog's measurements using the finest materials and I work "one on one" with each client to assure every coat fits like a glove. Learn about Polartec fabric and construction of our "Designed for Danes" custom dog coats on this page. Necessity inspires design.. You see that's how this all started back in 2004. At the time, I was having a very difficult time finding a warm dog coat for my Great Dane. After a Winter of frustration and countless dollars wasted trying out different coats from different sources, I gave up. That marked the beginning of something awesome. They say if you want something done right do it yourself. Exactly..
Was to create one of a kind Winter custom dog coats like no other. Unique, functional, top quality cold weather jackets for our cherished giants that actually fit. To provide comfort, safety, style, & maximum protection against nasty weather and cold temperatures. After a year in design, numerous prototypes and careful planning, Alpenhitze™ was born and we've been providing "Alpine Heat" to dogs the world over for the past decade. About: Polartec is the brand name of an ultra high end, high tech, extreme condition fabric that's super strong, breathable, water repellent, lite in weight, and weather tough. 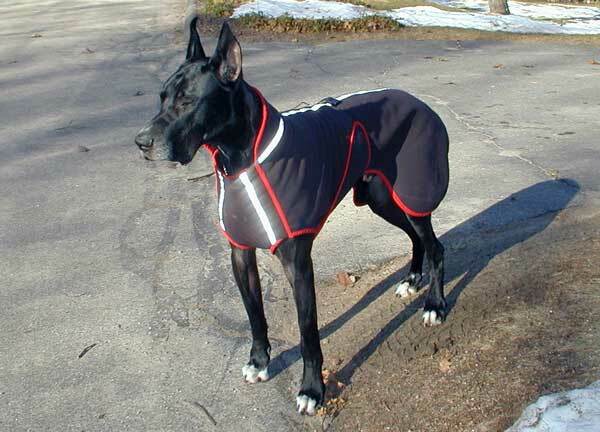 We offer Alpenhitze™ custom dog coats to the Great Dane community and as of 2010, to all other breeds. Alpenhitze™ provides "Alpine Heat" and is the best total Winter protection for any dog. Now in our 11th season, we've sewn coats for almost every breed and have shipped worldwide! Trivia: Our coats are named "Alpenhitze™", meaning "Alpine Heat" in German, to honor the Great Dane's heritage as our breed inspired its design. Eleven seasons is a long time and we've made many improvements to our custom dog coats over the years. In 2012, due to increased demand by medium to small breed families, our giant Great Dane size coats were downsized to fit all breeds. 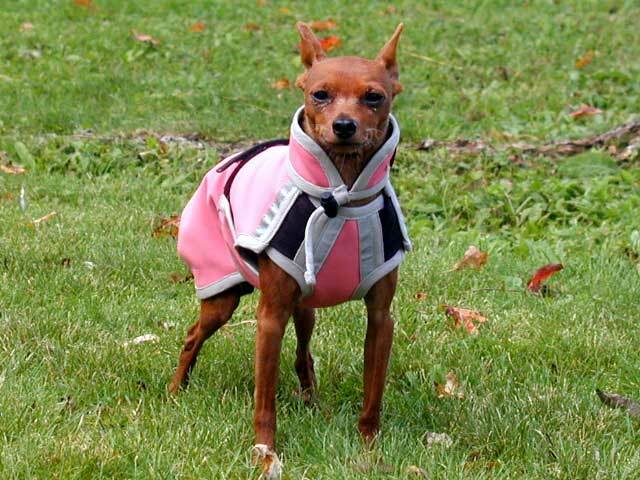 That's a six pound Miniature Pinscher in a scaled down Alpenhitze™ coat built "Great Dane Tough". Our 2012 season also marked the launch of our jZ Canine website and brand name. As far as our coats go, we're not just all about Great Danes these days and all coat purchases have since been shifted to www.jzcanine.com. We still build our custom dog coats per order and have fitted dogs as small as Chihuahuas, shipped close as next door & far as Australia, New Zealand and Northwest Territories. Is key to Alpenhitze™ function! Our proprietary custom dog coats are unlike any other dog jackets available. Coats are built with Polartec, the most advanced triple layer outdoor fabric that is often used by high end winter clothing manufacturers to make jackets, pants, and gloves. Outdoor wear that has skied Aspen and traversed the mountains of Austria. This extreme condition, soft-shell, water repellent fabric is highly wind resistant, providing 98-percent wind blockage while allowing 2-percent circulation. The breath-ability of the fabric out performs 100 percent wind block materials and Alpenhitze™ custom dog coats will not allow your dog to overheat. The non-rustling, soft, water repellent outer shell of our custom dog coats is a tightly woven nylon that resists abrasion, snags, and other outdoor hazards. Air dry in a well ventilated area after use. Keep the coat free of loose dirt or sand by shaking it off or brushing with a soft bristled brush. Our custom dog coats are machine washable in cold water only, avoid fabric softener and allow to drip dry. • Professionally built using the finest materials and hardware. • Excellent wet weather properties and water repellent, extremely lite in weight, yet incredibly warm. • Unique design of the bottom panel allows adjustment for any size girth. • Unique proprietary collar is fully adjustable with a draw cord closure. • Collar can be removed on warmer days and is fastened to main panel with 2 heavy duty 5/8" nickel snaps. • Proprietary 2-way stretch heavyweight Lycra panels run the length of the shoulder offering free range of movement. • Full Chest/Belly Panel wraps under, up and around the body, fastened in place with a non slip PVC Cam-Lock clamp. • Full Hip Coverage with unique rear "sewn in darts" include 3M Scotchlite trim for night time visibility. • Coat completely covers and wraps the hips, ideal for dogs with hip dysplasia, arthritis & painful joint ailments. • Adjustable rear leg straps keep Alpenhitze™ in place. • You will be amazed when Alpenhitze™ arrives at your door! Visit our Contact page located in the top navigation menu to send me an email, or call (508) 538-1150 any time.